In the past 50 years women's legal status has improved all over the world. But many laws still make it difficult for women to fully participate in economic lif whether by getting jobs or starting businesses. Discriminatory rules bar women from certain jobs, restrict access to capital for women-owned firms and limit women's capacity to make legal decisions. 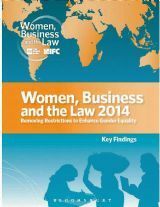 Gender differences in laws affect both developing and developed economies, and women in all regions.